Will you buy a PS4K at launch? The format holder has changed the model number for its Jet Black PS4 Pro, switching from SKU CUH-7000 to CUH-7100. The upcoming PS4 Pro Monster Hunter World SKU will also feature this change in model number. 4Gamer (via DualShockers) contacted Sony of Japan and Asia, who confirmed that the changes were due to some internal components being updated. These changes are within Sony’s usual practices, with any changes in PS4 hardware having no influence on the look and performance of the system. As such, owners of the PS4 Pro CUH-7000 model have no reason for concern, as their console won’t be made irrelevant. The PS4 Pro was released in November 2016 and is a high-end version of the standard console. The extra horsepower allows for improved performance with 4K resolution and higher frame rates, as well as HDR support. Sony has not yet divulged how many units the PS4 Pro has sold, but has said that one in every five PS4s has been the high-end version. Interestingly, despite the added horsepower, Bungie has claimed PS4 Pro is not powerful enough to run Destiny 2 at 60fps. According to Lempel, the company sold more consoles than it ever had in its 22-year history on Black Friday. Lempel also mentioned that while some people were beginning to doubt the abilities of consoles to sell, PlayStation 4 has been “thriving,” with Lempel referring the recent Sony Corporation earnings that reported the company was up in profits by 346%, a majority of which has come from the PlayStation business. Nagpabili ako sa Canada nung Black Friday. Around 18k. Mga January or February ko pa siguro makukuha. Congrats! Horizon Zero Dawn shines on the Pro with a 4k display and HDR! It's a real great showcase title! Kaya hindi ko muna lalaruin ang The Frozen Wilds at The Witcher 3. Hintayin ko muna dumating yan. Congrats bro! Ako rin kakabili ko lang ng Pro 2 weeks ago. Napaisip tuloy ako kung laruin ko na yung Witcher 3. Hintay na lang din ako after makabili ng 4k TV. Hopefully earlier next year. Baliktad naman sa akin. Nauna ang 4K TV. Last year pa ko nakabili pero ngayon pa lang yung PRO. Ako I made sure na nauna yun 4K TV ko then afterwards ako bumili ng PS4 Pro. Yep, bad trip lang talaga at hindi isinama ng Sony yung 4K BD player sa PS4 Pro. Yung mga movies pa man din na binibili ko eh puro 4K na din. Sony is launching a PS4 Pro price cut in a PlayStation December sale in the US. To make up for those who missed out on some great PS4 Pro Black Friday deals, PlayStation will be listing various PS4 Pro bundles starting at $349.99 ($50 less than the original price). On top of that, you can also grab a PlayStation VR in a bundle deal, with prices starting at $199.99. Check out the best PSVR games. 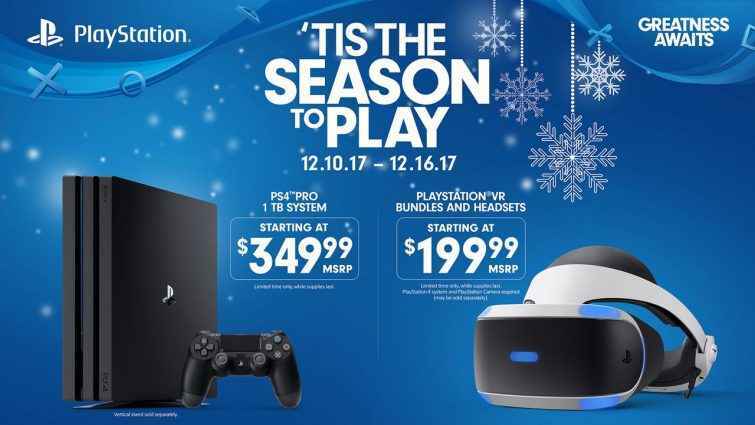 The price cuts on the PSVR bundles begin on December 10 and run until December 24. Note: The Destiny 2 offer features the glacier white PS4 Pro! May parating pala na White PS4 Pro! Anyone here who owns a white ps4? Di ba naninilaw? Yung white DS3 ko dati nanilaw.